Would you like a meaningful and lasting remembrance of your wedding day? Or perhaps a unique wedding or anniversary gift to express your love to someone special? My mission is to use my artwork to help people express and celebrate love. 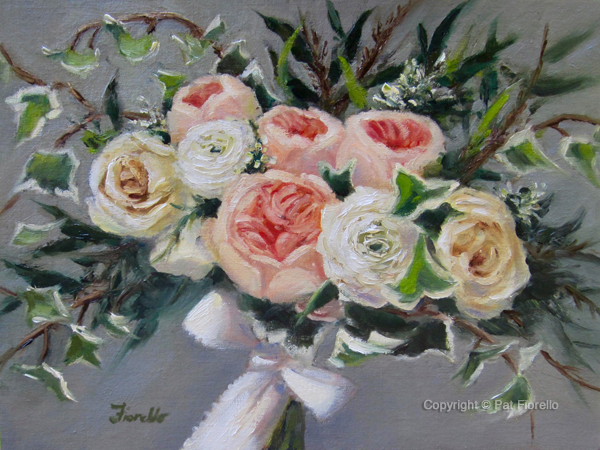 I specialize in painting flowers and can create a “Forever Bouquet Painting” to commemorate your wedding day. 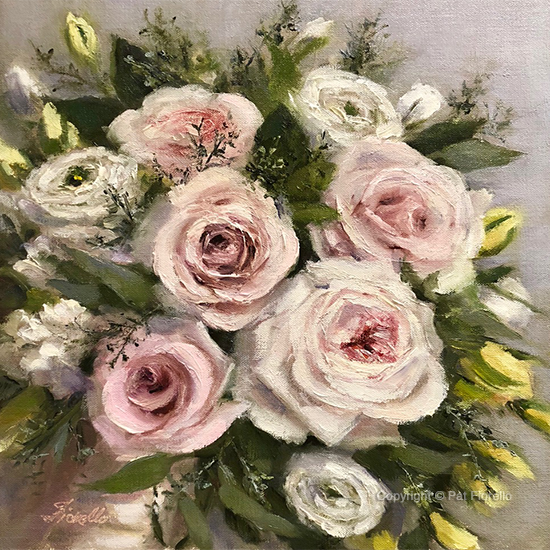 Your wedding is one of the most important days of your life and the carefully selected and designed flowers are an important part of the festivities, adding to the beauty and joy of the day. But flowers are short lived. 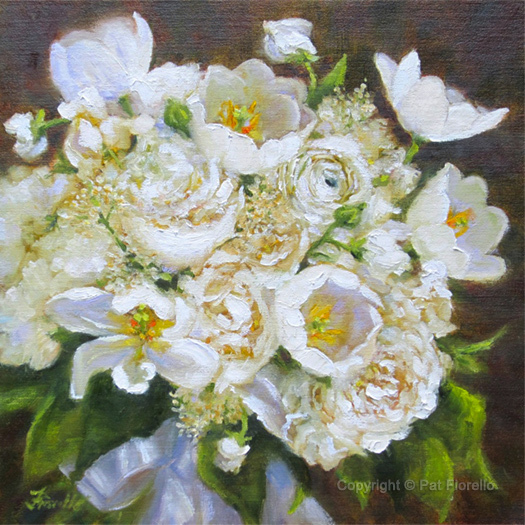 Brides often wish they could keep their bouquet- likely the most spectacular flowers of their life. 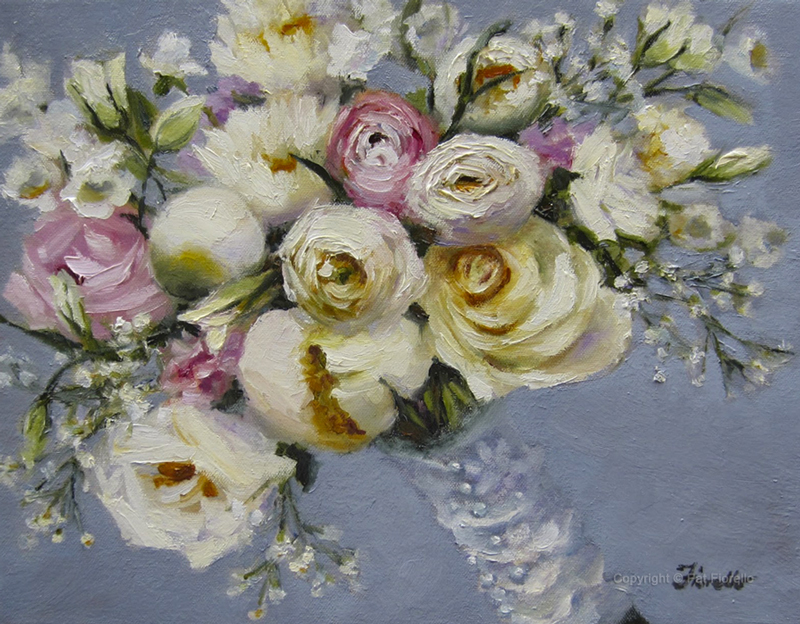 There are other methods to preserve a bridal bouquet, but nothing evokes emotion like a painting. 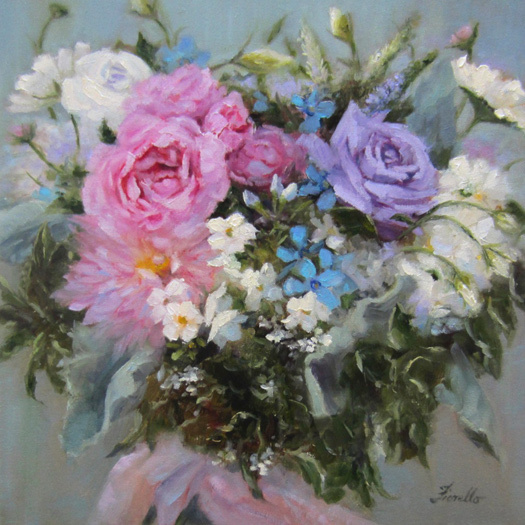 It is a colorful and vibrant representation of your bouquet in its ideal state. 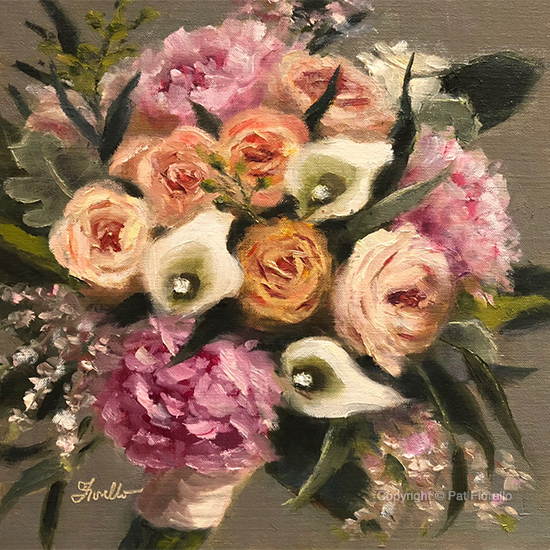 This custom painting inspired by your bouquet will be a cherished keepsake of your wedding day and a lasting reminder of your love each day when you view it in your home. 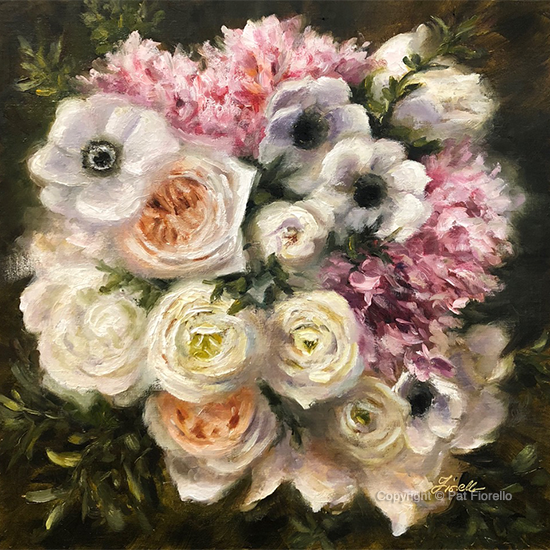 “Forever Bouquet Paintings” are finely crafted, original oil paintings which are often commissioned as a meaningful and memorable gift of love from parents of the bride or from the groom. 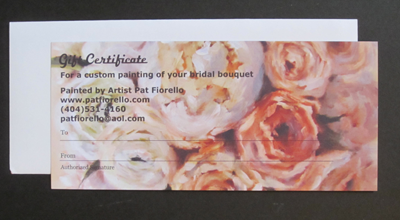 Gift certificates are available for a unique and special bridal shower, wedding or anniversary gift. 1. 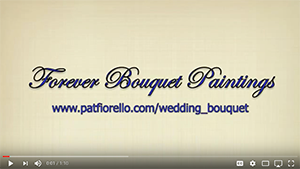 Simply contact me via phone or email and send some photos of your bouquet. 2. 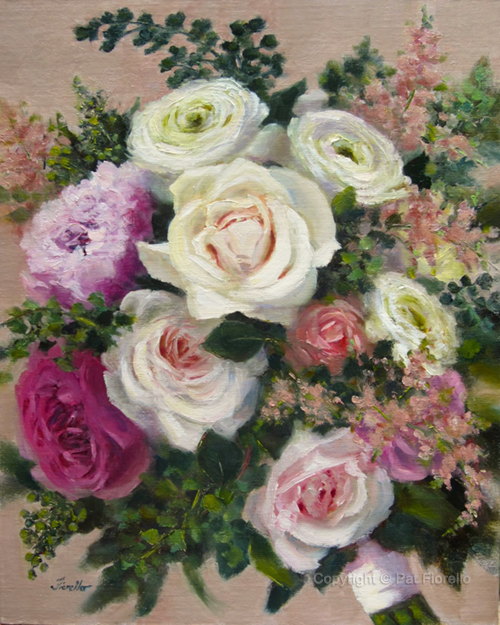 I will send a recommendation on the best design for your painting. 3. We agree on design, size, price and any other requirements, a short agreement is signed and 50% deposit is paid via PayPal. 4. I create your painting and along the way I will send a photo of work in progress for your approval. 5. I complete the painting, let it dry, varnish and ship it to you. Payment in full is due prior to shipping. Since I work from photo’s there’s no need to send the actual bouquet. And distance is no issue. I have worked with clients from all across the U.S. and even internationally. 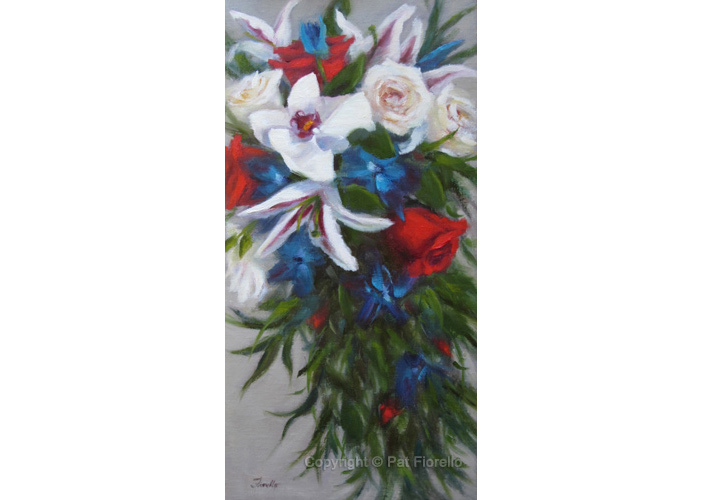 Everything can be handled via email and the finished painting will be shipped directly to you. Typically allow 4-6 weeks for completion. 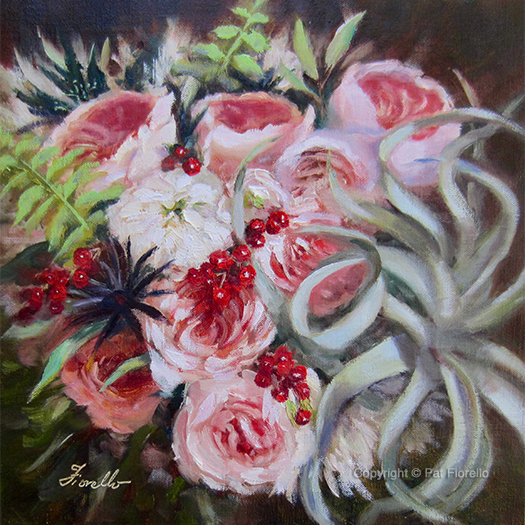 I would be honored to create a beautiful, meaningful and lasting work of art for you or as a gift for someone you love! 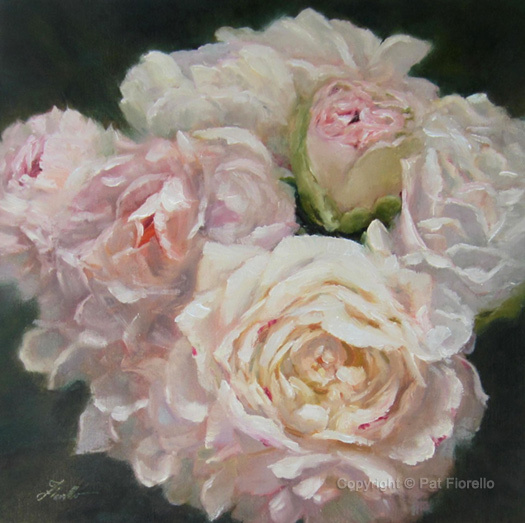 Commissions are done on archival canvas on panel for oil paintings and are unframed. 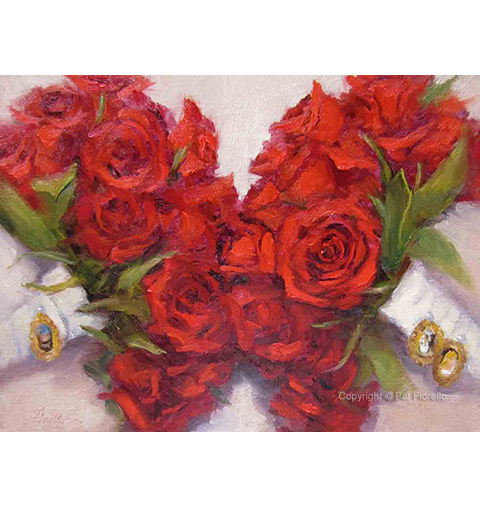 A Gallery Wrap option, which does not require framing, is available. 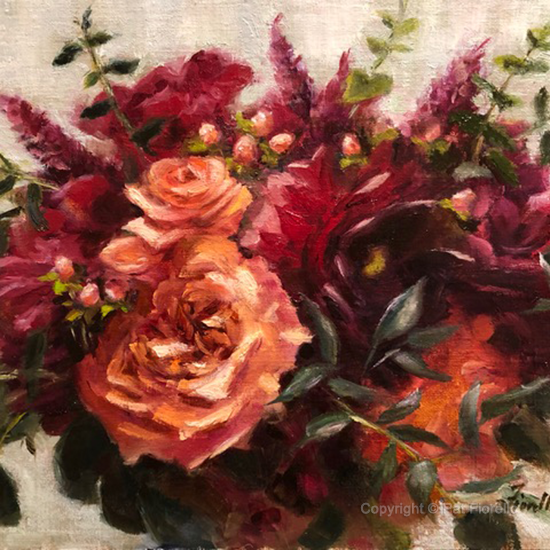 I also offer a framing option, so that your painting can come to you ready to hang and complete with a custom engraved plaque with a personal inscription. Great idea for a unique bridal shower, wedding or anniversary gift your bride will treasure. I received the painting today! It’s beautiful!! Absolutely lovely!! Thank you so much!! 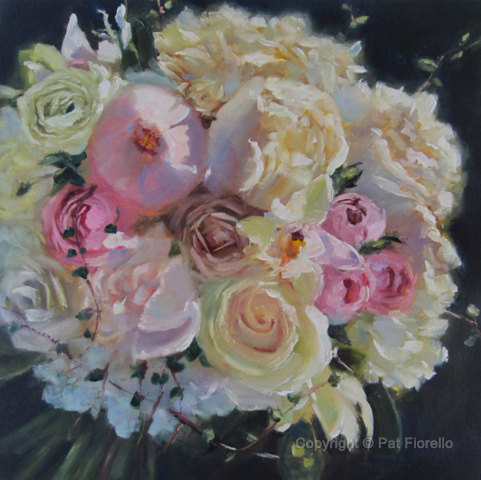 Dear Ms. Fiorello, Thank you so much for the incredible bouquet painting! I have been so excited about it for the past few weeks, and it has far surpassed my expectations! I can't wait to get it framed and hang it up on our bedroom wall. It is the most perfect reminder of all the love and joy we had on our wedding day and we will continue to have throughout our marriage! Thanks again for sharing your talents with us!! This looks absolutely wonderful! Very excited to give it to my wife for our anniversary! So so lovely!!! WAY better than if I had tried to dry and save the actual bouquet. So excited!!!! 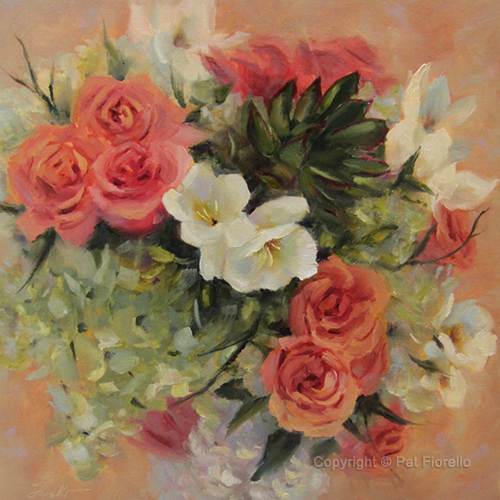 Hi Pat, Confirming I received my painting last night and I absolutely love it! I cannot wait to get it framed and hang it on my wall. I really think it came out beautifully and it is such a special reminder of our wedding day. I cannot thank you enough. I will most definitely be referring your work to my engaged friends! Hi Pat! Thank you for the sweet note! We had a great day, and Rachel loves her painting! We are both very impressed with your work and will happily recommend you to anyone who is looking to have a painting commissioned. "The painting arrived and it is beautiful!!!! I am so happy that MaryKay put me touch with you, and I know Katie and Michael will love it. I will send you a picture of them with it after I give it to them in August. It was a pleasure dealing with you and I will certainly spread the word here if I know anyone who would also like such a unique and special gift. 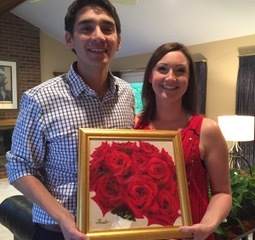 "Hi Pat, We gave Michael and Katie the painting of her bouquet and they were so happy and LOVED it! Could not believe how lovely and such a forever keepsake! 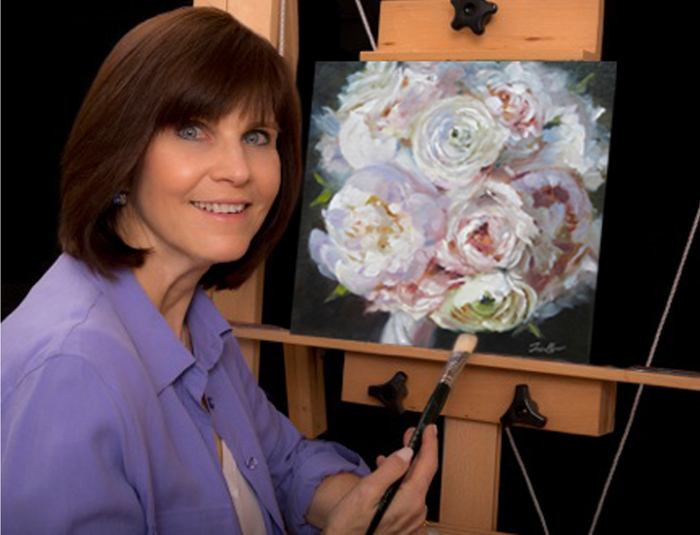 "Thank you so much for spreading love through your paintings!" "We have just given the painting to our son & his wife. They were surprised & impressed with the painting & the gesture. 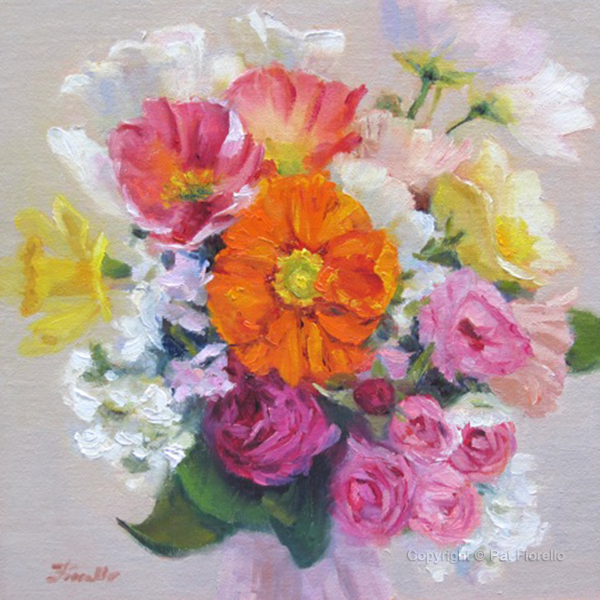 I was so pleased to give them such a personal gift & I know they will enjoy it over the years. Their wedding was simple but very very warm & delightful. It really reflected their personalities, and all of us in the family remember & speak about it often. We all will enjoy remembering it again each time we see the painting. 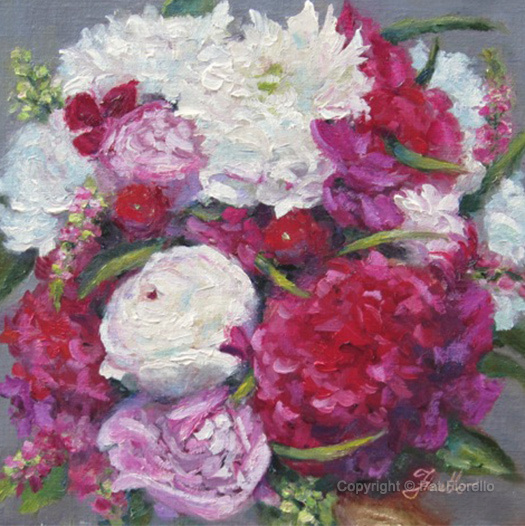 "The painting of my daughter's bouquet has arrived and it is stunningly beautiful. This painting will be enjoyed for years to come. You have immense talent. Thank you for working with us." "Hi Pat - I just got home from work and picked up the package from our front desk. The painting is absolutely beautiful! The pictures did not do it justice. Thank you for capturing a part of our wedding that we can look back on forever! " 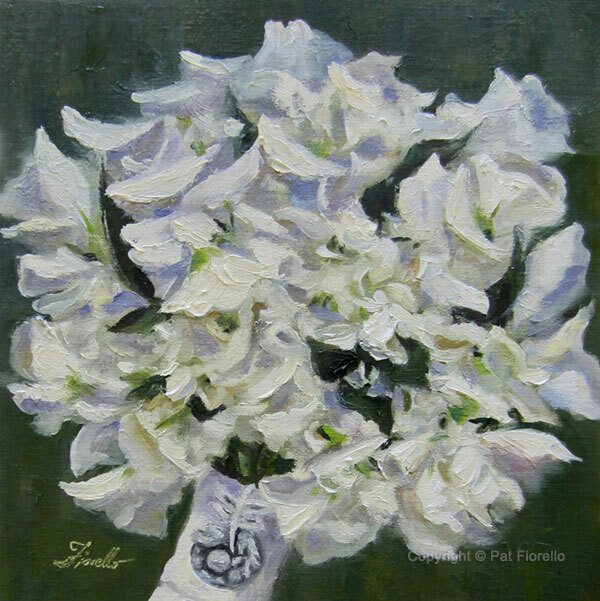 "Pat, I gave my wife the painting and she was absolutely blown away by it. 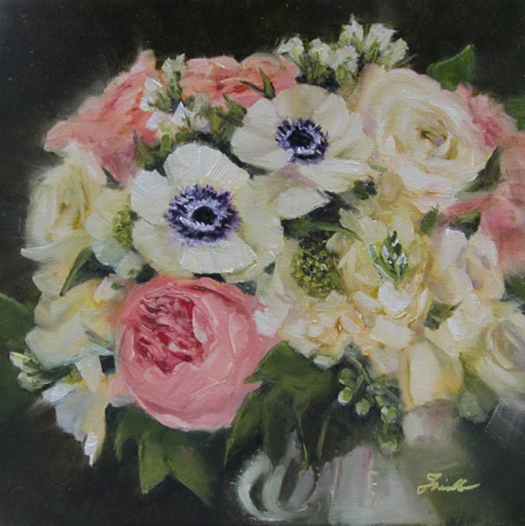 She couldn’t believe the amount of detail in the painting and how accurate it was to her bouquet. She is excited to have it displayed in our home forever and have it be a constant reminder of our wedding day. She has continuously mentioned that her bouquet was one of her favorite parts of the entire wedding, so I am glad she now has something that can remind her of that forever. Again, I can’t thank you enough for helping making this 1st anniversary very memorable for us." "Pat I think the painting looks beautiful. I will be very proud to present this to my wife and also show off in my house! You have great talent and are very good at what you do. "My wife absolutely loved the painting. She was completely surprised and cannot believe what an amazing job you did. Thanks again for giving me major husband points!" " Just received the painting and it's perfect! Thank you again for making such an amazing gift!" Hi Pat! Arrived today and it's so beautiful!! It's already on our entry wall. Thank you, thank you for the beautiful painting! My wife absolutely loved it! It turned out even more beautiful than expected. Thank you again for all your help. 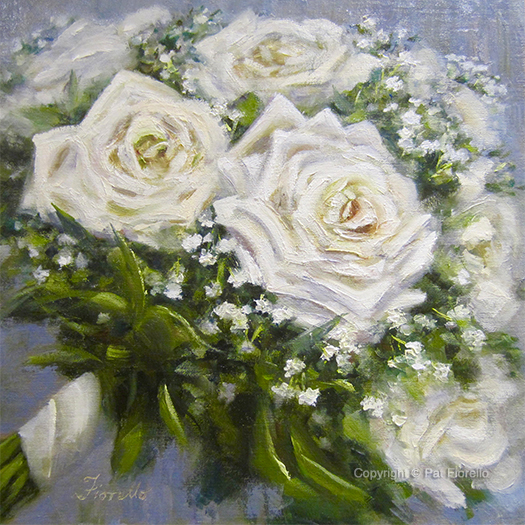 My heart leaps every time I see the finished painting of my daughter's wedding bouquet. 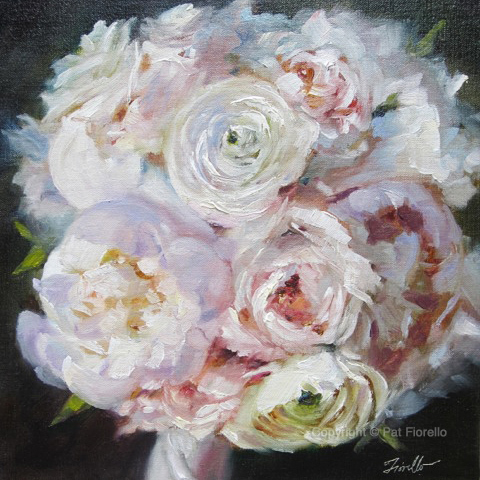 Her actual bouquet was indeed stunning, but your painting takes my breath away. If I did not know the truth, and you had told me that it was painted by one of the first Impressionist painters, I would have believed you. The flowers are lush and timeless, and I am SO glad we did this for our daughter. 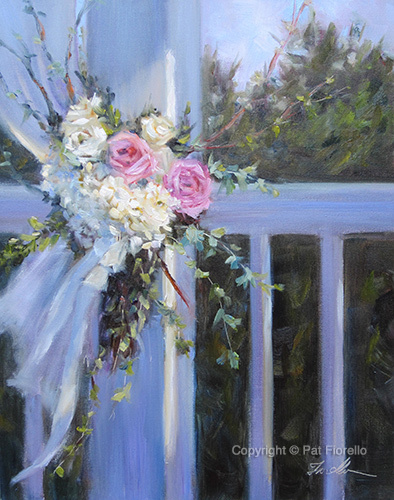 I can think of no other present that will evoke such beautiful memories of her wedding day, every day. 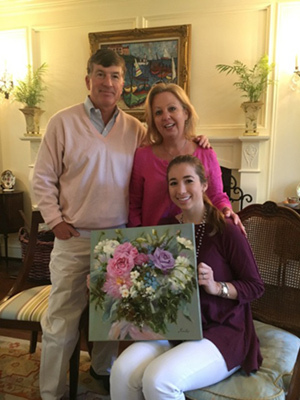 She is so excited to have such a beautiful painting in her home. I had thought about having her wedding bouquet dried and put in a shadow box or glass dome, but I was not feeling good about the anticipated outcome. 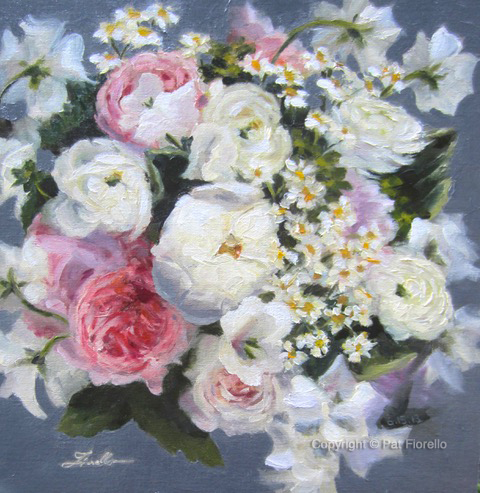 As you may know, no matter how you preserve flowers, they do lose much of their natural beauty in the process. Thank goodness I kept searching for ideas. Then I had a brainstorm! 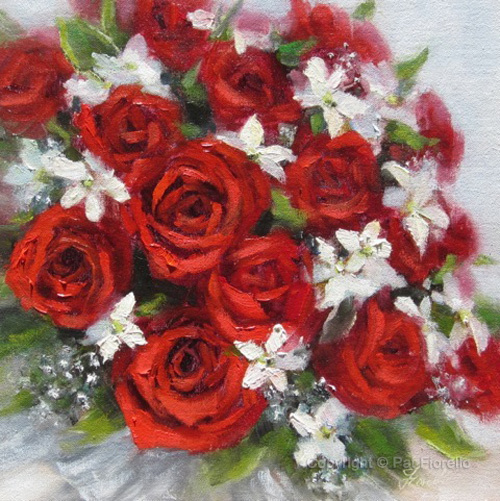 What about a painting of Alex's bouquet? 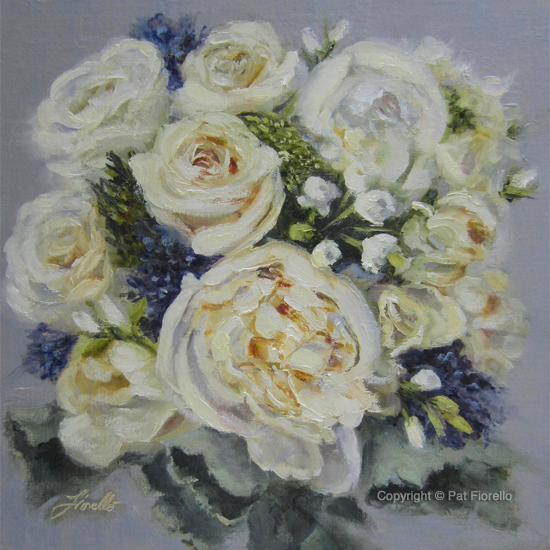 I searched for "bridal bouquet paintings" on my computer and I discovered your web site, patfiorello.com It took me no time at all to see that you were an actual artist, not someone who did this for a hobby. 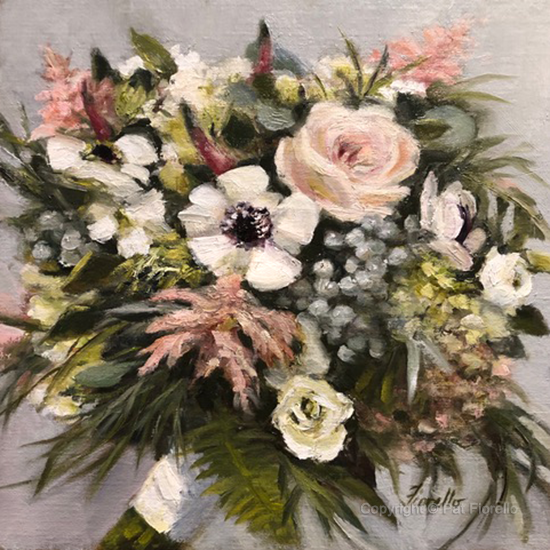 When I compared the cost of freeze drying and framing her bouquet to the cost of the painting, I felt there was no way to compare the two. 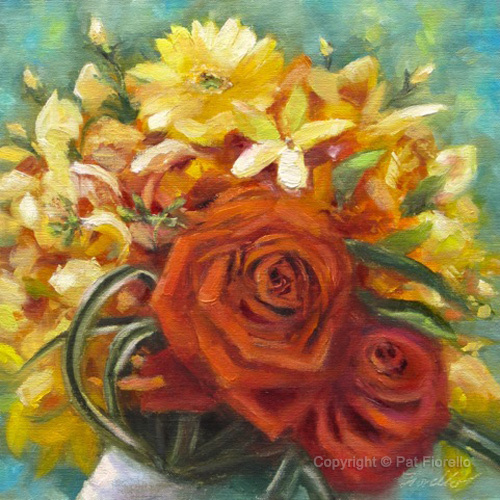 Dried flowers would become a frozen memory, and your painting would be something of lasting beauty. Thank you so much for working with Alex and myself in creating this wonderful gift. You could not have been nicer and you made everything happen effortlessly. It's great to work with a professional like yourself and we could not be happier with the final product. I can't wait to visit my daughter in Atlanta so we can see more of your works. Well done and thank you Pat! 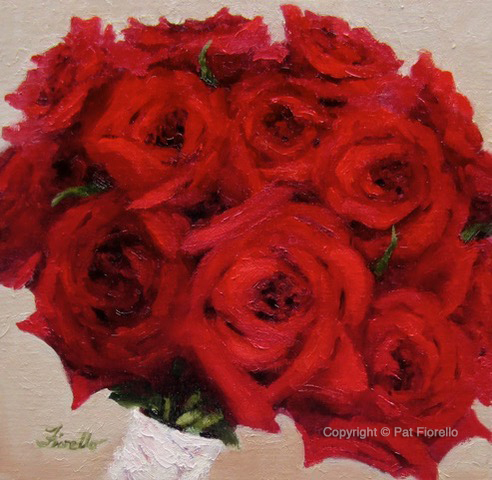 "Pat we have given your beautiful painting to my son and daughter-in-law. Words cannot express the excitement and emotions. They both were truly overwhelmed. Even my son, which we didn't expect. I went through the whole story of how I found you online and the easy way everything just flowed together from beginning to end. She said, "Sue you are so thoughtful". My husband was beaming. She said in between tears, that she was only saying to her friends just the other day that it is such a shame that bouquets don't last". 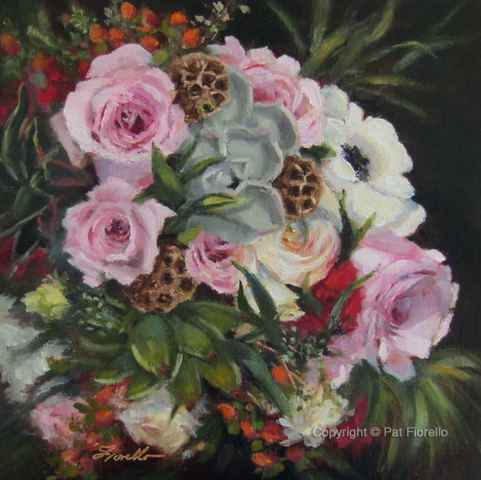 Thank you Pat Fiorello! The best and most unique wedding gift I have ever purchased! Betsy will cherish this forever!! We love it!!! It's absolutely gorgeous!!!!!!! Thank you so much. 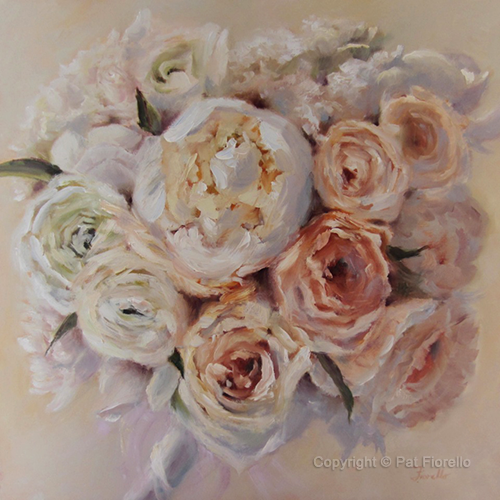 Dear Pat, Thank you so much for painting my beautiful wedding bouquet! You really captured every detail in your strokes. This is such a meaningful gift to me, and I can't help but stare at this beautiful painting every day! thank you again! Pat, I was so eager to get this and I can't stop looking at it. I am entranced. My eyes feel like they are being pulled into the painting! I can say enough I LOVE IT! Glad to report that my wife was overjoyed with the artwork and so was everyone else who has seen it! She is real happy. Really appreciate all your help and inspiration. Hope to work with you again in the future!